Use this deed form to make minor corrections in a previously recorded warranty, special warranty or quitclaim deed. 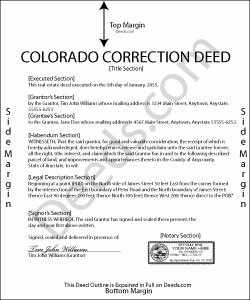 In Colorado, a previously recorded deed can be corrected by recording a second deed, called a correction or corrective deed. The sole purpose of such a document is to prevent potential title flaws, which may create problems when the current owner attempts to sell the property. The correction deed does not convey title but confirms the prior conveyance. For the most part it reiterates the prior deed verbatim, except for the corrected item and the consideration. The errors usually adjusted by a corrective deed are minor omissions or typographical mistakes, sometimes called scrivener's errors. Among those are misspelled names, omitted or wrong middle initial, a minor error in the property description, or an omitted execution date, or a faulty acknowledgment. However, certain types of changes cannot be achieved by using a correction deed. For example: the addition or omission of a grantee; changing the manner in which title is held to/from "joint tenants with rights of survivorship"; making material changes to the legal description; or deleting a portion of the originally transferred property. As far as changes to the legal description are concerned, use a correction deed only if a portion of the property was left out of the original conveyance. The correction deed must be executed from the original grantor to the original grantee and state that its purpose is to correct a specific error, identified by type. It references the prior deed by date(s) and recording/reception number, as well as county of recording. A correction deed generally is exempt from state documentary fee (CRS 39-13-104(1)(f), which is calculated based on the consideration stated in the deed. Thus, many counties advise to enter $0 as consideration and to state the exemption on the correction deed (CRS 39-13-104(2)). Joe L. said: Great service, and fast.